Every day, our skin faces an onslaught of environmental stressors that make our skin look tired, dull, and older than it should. To combat this, Kyani created their Fleuresse serum, a cutting-edge formulation that enhances skin's clarity, fights fine lines and wrinkles, and helps reduce the visible signs of ageing. 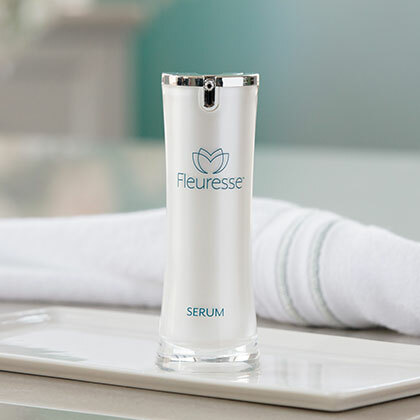 Fleuresse Serum, a lightweight and refreshing serum, features extracts from the stem cells of a rare Swiss apple. This apple, Uttwiler Spätlauber, is famous for its ability to stay fresh for longer than any other variety. Scientists discovered that particular botanicals in this variety help protect it against inflammation and oxidative stress. By harnessing the power of these stem cells, Kyani was able to create a supercharged serum that helps boost skin’s defenses against the inevitable causes of ageing. Apply one or two pumps of the serum to clean skin, including your neck. Wait at least a minute for the serum to be absorbed before applying your day or night crème.